Suggest that your kid go for grey wool dress and Sweet Heart Rose sweetheart rose three piece sailor top skirt dress and leggings set to create a smart casual look. Black ballet flats are a nice choice to finish off this ensemble. 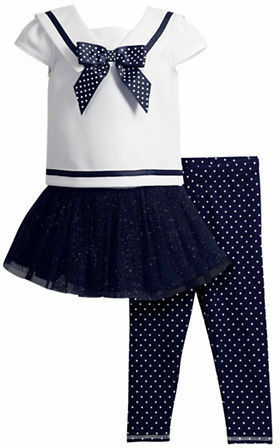 The versatility of blue denim dress and Sweet Heart Rose sweetheart rose three piece sailor top skirt dress and leggings set makes them great pieces to have in your little angel's wardrobe'. Silver sandals are a nice choice to finish off this ensemble. 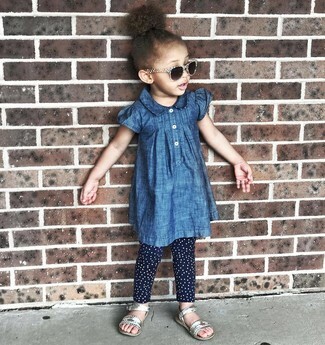 Suggest that your mini fashionista pair navy denim dress with navy polka dot leggings for a trendy and easy going look. As far as footwear is concerned, suggest that your darling throw in a pair of green sneakers.